The U.S. economy and government budgets appear to be getting a little stronger as 2013 gets underway. The 2013 Keating Report includes analysis of federal, state budgets, and local government budget trends, as well as an in-depth look at public works and transportation construction and public-private partnerships. The U.S. economy and government budgets appear to be getting a little stronger as 2013 gets underway. Yes, state budgets are improving, with as many as 45 states and the District of Columbia expecting to get bigger tax takes in fiscal-year (FY) 2013 compared to FY 2012. Even so, there is concern that future budget brawls in Congress may stall the recovering U.S. economy. The 2013 Keating Report summarizes survey results that show how city finance officers and other government officials coped with a sluggish economy in 2012, and how Kent, Wash., is hiking fees and taking other revenue-boosting steps in 2013. Officials from the Council of State Governments, the National Council for Public-Private Partnerships and other organizations weigh in on 2013 government budgets, spending, construction, public-private partnerships and related topics. The Keating Report 2013 forecast on government budgets and government spending will be in the January edition of Government Product News. The 2013 forecast is an update of our mid-year 2012 forecast that was published in the June 2012 edition of Government Product News. Michael Keating is senior editor for Govpro.com and Government Product News. He can be reached via e-mail at michael.keating@penton.com. The value of federal purchases of goods and services will equal $1.20 trillion in 2013, down slightly from $1.22 trillion in 2012, according to IHS Global Insight. Sure, the federal budget deficit in 2013 will still be huge, but so are federal government revenues. The federal government ran a deficit of $292 billion for the first two months of fiscal year (FY) 2013 — October and November. In FY 2013, the U.S. federal budget deficit is projected to be $901 billion. Total federal revenues, says the Congressional Budget Office (CBO), will rise to $2.91 trillion in 2013, up from $2.44 trillion in 2012. Download the projections of the CBO’s recent “An Update to the Economic and Budget Outlook: Fiscal Years 2012 to 2022,” from the CBO’s web site. The indicators are pointing to a continued sluggish U.S. economy in 2013. The World Bank cut its GDP projection for the U.S. in 2013 by 0.5 percentage points, forecasting GDP growth of 1.9 percent, down from the already meager 2.2 percent for 2012. It is projecting an improvement by 2015 to a mere 3.0 percent, which is too tepid a rate of growth to significantly reduce unemployment levels. And if employment rates are stagnant, that may translate into minimal growth in federal revenue from payroll taxes. It’s worth noting that the U.S. GDP levels in the fourth quarter of 2012 were adversely affected by plunging farm output due to a cold snap and the effects of Hurricane Sandy. The St. Louis-based Macroeconomics Advisers forecasting firm is projecting that the U.S. unemployment rate will edge down to about 7.6 percent at the end of 2013 and to 7.2 percent by the end of 2014. The same forecasters are projecting that core consumer price inflation will stay in check for the near future. They expect the consumer inflation rate to average 1.8 percent over 2013, rising to 2 percent in 2014. Globally, the forecast is somewhat glum. In mid January, the World Bank projected an expansion of the world economy in 2013 of only 2.4 percent, down from its forecast six months ago of 3.0 percent. The World Bank is a Washington-based international lending agency. At first glance, state government budgets appear to be on the mend. According to the Denver- based National Conference of State Legislatures‘ (NCSL) fiscal brief “Projected State Tax Growth in FY 2013,” 45 states and the District of Columbia expect total tax collections in FY 2013 to be higher than they were in FY 2012. Nine states expect total tax collections to grow at least 5 percent above FY 2012 levels. Yes, “[state] revenue growth has slowed relative to last year,” says Elizabeth McNichol, a senior fellow at the Washington-based Center on Budget and Policy Priorities. She explains: “States are still far from fully recovered after the biggest revenue decline in history. Since bottoming out in 2010, state revenues have been growing slowly again, but, as of October, state revenues remained 6 percent below pre-recession levels after adjusting for inflation. Globally, the economic difficulties sweeping over Europe and sluggish growth in Asia along with the political turbulence in the Middle East are dark clouds that are looming over national and state economies, says Sujit CanagaRetna, a fiscal analyst for the Lexington, Ky.-based Council of State Governments (CSG). So state government budgets are looking healthier. But state governments, cautions CanagaRetna, still face a number of significant expenditure categories that have to be dealt with in the coming years. Some of the problematic expenditure categories include increased Medicaid costs, higher pension liabilities as many state workers retire, and costly infrastructure repairs that have been delayed. Cities continue to face the prolonged effects of the economic downturn, according to a recent report by the National League of Cities (NLC). The 27th annual “City Fiscal Conditions” report shows that for the sixth straight year, city revenues continue to fall. Cuts in state and federal aid are impacting cities’ bottom lines, as well as health care, infrastructure and pension costs. The NLC report, which is based on a survey of city finance officers, shows that fiscal pressures are forcing cities to make personnel cuts, delay or cancel infrastructure projects and trim local services. The report also projects that 2013 will continue to present challenges to city budgets due to slumping housing markets, persistently high unemployment and potential federal budget cuts. There are signs of fiscal improvement in cities as 2013 starts, however. Despite city budgets that continue to register the effects of the economic downturn, cities are better able to meet their financial needs than in previous years. In 2012, 57 percent of city finance officers reported that their cities are better able to meet fiscal needs than in 2011. In addition, city finance officers report they are seeing an uptick in sales tax revenues in their communities. Revenues, say the fiscal officers, are projected to rise by 2.4 percent in 2012 over 2011 levels. Finance officers named a number of budget concerns they are coping with in their communities’ budgets. Most cited increased health care costs (81 percent), pension costs (77 percent), infrastructure costs (75 percent) and public safety demands (61 percent). Respondents also noted a general increase in costs (83 percent) along with reduced federal aid levels (51 percent), declining local tax bases (47 percent) and decreased health of the local economy (42 percent). The NLC report finds that cities are taking action to ensure appropriate levels of funding for city services and budget requirements. Two in five (43 percent), for instance, have raised fee levels. Govpro.com found several examples of local governments boosting fees and taxes to stretch budgets. In Kent, Wash. (population, 120,916), the city council recently adopted Kent’s 2013-14 biennial budget that provides $72 million a year to pay general operating costs. The Kent budget includes a 6 percent tax on cable television bills to raise about $1.3 million per year, higher permit fees for developers to bring in about $1 million per year, and a 1 percent increase in the property tax levy to raise about $198,000. The 6 percent tax on cable television bills will raise money to help pay for information technology staff as well as computer hardware and software. Kent residents also will see storm drainage rates go up 5 percent, sewer rates up 4 percent, and water rates up 3 percent, as a result of council’s approval of the 2013-14 budget. In October, the Kent City Council voted 6-1 to adopt a business and occupation (B&O) tax to help raise an estimated $5 million annually to pay for street repairs. The council adopted the tax on the gross revenue of businesses as part of its three-step approach to fund park and street repairs. Beyond hiking fees, cities are taking some austerity measures to cope with tight budgets. According to the NLC fiscal report, the measures include (with percentage of respondents): shrinking the size of their workforce (48 percent), decreasing human services spending (21percent), and reducing spending for services other than public safety and human services (25 percent), such as parks, recreation and libraries. County officials, likewise, are a little more optimistic about their jurisdiction’s budgets, according to the National Association of Counties‘ (NACo) recently released 9th annual “National Survey of County Elected Officials.” The poll invited responses from a random sample of 501 county elected officials on issues related to the economy, budgets and politics. In the latest survey, about 43 percent of responding county elected officials rated the economic conditions in their community as “excellent” or “good,” which was up from 31 percent in 2011 and just 28 percent in 2010. The number of county leaders who rated their community’s economic conditions as “fair” or “poor” was down significantly in the latest NACo survey compared to earlier years. Despite the expressed local economic optimism, county elected officials see the greatest threat to fiscal health as insufficient revenues, cited by 21 percent of respondents. Other major threats include the poor economy and unemployment. Other threats cited were unfunded mandates (13 percent), health care and an aging population (7 percent). For 2013, the U.S. transportation construction infrastructure market is expected to show modest growth, increasing three percent from $126.5 billion to $130.3 billion, according to the American Road and Transportation Builders Association‘s (ARTBA) annual forecast. Growth is expected in highway and street paving, private work for driveways and parking lots, airport terminal and runway work, railroads, and port and waterway construction, says ARBTA’s chief economist, Dr. Alison Premo Black. ARTBA predicts the bridge market, which has shown substantial growth over the last 10 years, to remain flat in 2013. One of the reasons for the coming modest surge in construction: the July 2012 passage of the two-year Moving Ahead for Progress in the 21st Century surface transportation act, known as MAP-21. Because MAP-21 contains no new real federal dollars, pavement construction and rehabilitation will be uneven across the U.S. The legislation will keep federal-aid highway appropriations at or near recent levels with total highway and bridge authorizations of $40.7 billion in FY 2013 and $41.0 billion in FY 2014. The MAP-21 legislation simplified financing of road construction through tolling on new highways, so Denver, Houston, Minneapolis and other communities are charging tolls on high-occupancy vehicle lanes, and on bridge tolls in Seattle, according to the “2013 Dodge Construction Outlook” from New York-based McGraw-Hill Construction. Public-private partnerships (PPP) are also serving as vehicles to finance large highway and bridge projects. Two examples: the $1.2 billion design-build contract signed this past October for segments of the Grand Parkway around Houston (SR-99), and the $450 million Route I-95/395 high-occupancy vehicle lane PPP in Virginia. Read more about public-private partnerships later in the 2013 Keating Report. 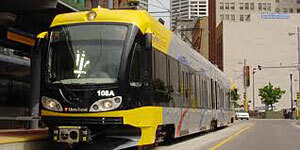 Other public works construction, such as public transit construction projects, will remain fairly steady in 2013, predicts the “2013 Dodge Construction Outlook.” Value of other public works construction in 2013 should reach $20.2 billion, which is close to 2012 levels, say McGraw-Hill economists. A variety of passenger rail projects, including BART’s $280 million Warm Springs Extension in San Francisco, are planned or underway. In Minnesota, the Southwest Light Rail Transit Project (Southwest LRT) is a proposed line from Eden Prairie to downtown Minneapolis. The passenger rail system will provide service to Eden Prairie, Minnetonka, Edina, Hopkins, St. Louis Park and Minneapolis, and is approximately 15 miles in length. The Southwest LRT line will connect two of the region’s largest job centers, downtown Minneapolis with more than 140,000 jobs and the Opus/Golden Triangle area with more than 30,000 jobs. The Obama administration has said that the permit-approval process would be expedited for the Southwest LRT project. The White House says the goal is to complete the federal permit and review process by November 2014. The Southwest LRT line could enter its engineering and design phase in early 2013, construction in 2015-2017, and be operational by 2018. On the public construction front, a variety of airport runway and taxiway projects will start in 2013, thanks to passage of the FAA Modernization & Reform Act of 2012 that reauthorized Federal Aviation Administration airport capital and construction budgets through FY 2015. Water resource construction, part of the environmental public works construction category, should be stable in 2013, thanks to Congress’ recommendations that the federal Bureau of Reclamation’s Water Resources Programs be funded at $892 million for FY 2013, which is down only slightly from the FY 2012 appropriation of $895 million. The Sanitation District No. 1 in northern Kentucky recently completed an environmental public works construction project to serve the sanitary and storm sewer needs of Boone, Campbell and Kenton counties near the Ohio River. The district installed 8,000 feet of 84-inch-diameter pipe from Houston-based Hobas Pipe USA as part of the project. 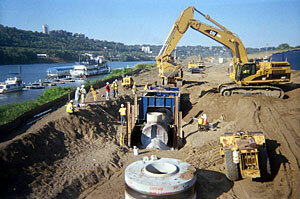 Engineers specified centrifugally cast fiberglass-reinforced polymer mortar (CCFRPM) pipe. The pipe replaced existing 24- and 30-inch sewer lines. The much-larger pipe will help the district comply with combined sewer overflow (CSO) issues, and meet the future needs of the area as new residential development takes place. In 2013, several factors will encourage public agencies to increase their use of public-private partnerships (PPP), said Richard Norment, who is executive director of the Arlington, Va.-based National Council for Public-Private Partnerships. “The continued budgetary challenges at all levels of government will reduce the available funds for projects and services, but the clear example of successful partnerships, as they become better known, will encourage many to follow this approach,” Norment told Govpro.com. “While transportation PPP projects will receive the most notoriety in the press, the real growth areas for PPPs will be in municipal buildings (from schools to courthouses and beyond), and energy generation and conservation projects,” said Norment. 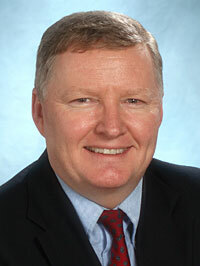 The public-private partnerships that CliftonLarsonAllen has worked on have mainly involved real estate development. “I foresee more partnerships like these occurring,” says Carroll. His firm serves more than 1,700 local, county, and state government agencies. Carroll specializes in serving the governmental sector, providing auditing and consulting services to special districts counties, cities, school districts, and charter schools. Houston-based Waste Management, Inc. (WM) provides a stormwater management offering to U.S. municipalities in the form of public-private strategic alliances. WM, in collaboration with AbTech Holdings, Inc., an environmental technologies and engineering firm that specializes in addressing water contamination issues, team up with municipalities to design, build, operate and service stormwater infrastructure. One year after announcing its pilot stormwater solutions program with AbTech, WM is transitioning to commercialization with its stormwater solutions. Along with these solutions, the program has the potential to include finance alternatives for municipal infrastructure projects as needed. Under WM’s stormwater program offering, AbTech Industries, Inc. will provide and deploy stormwater treatment technologies, deploying both their own technologies and other commercially available engineered systems, teaming with WM and municipalities. The program offering will also include stormwater needs assessments, design of stormwater control measures and ongoing servicing and maintenance of the stormwater infrastructure. A WM spokesman told Govpro.com that there is a high level of interest among state and local government officials in the WM stormwater management PPP concept. The spokesman said WM sees good opportunities, especially among California governments. Yes, the White House and Congress have temporarily resolved the fiscal cliff crisis. The legislation, The American Taxpayer Relief Act of 2012, signed by the president on Jan. 2, will raise approximately $617 billion in higher revenues from 2013­ to 2022. It raises taxes on individual net income over $400,000 ($450,000 for couples) while holding rates steady for income below that amount. The bill, and a House GOP deal announced on Jan. 18, however, delays until this coming spring the debt ceilng debate and how to cut spending. Some analysts warn that it’s no time to celebrate. “While the markets and most taxpayers may breathe a sigh of relief for a few days, excuse us for not celebrating,” said Greg Valliere, chief political strategist at Potomac Research Group. “We have consistently warned that the next brawl represents a far greater threat to the markets — talk of default will grow by February, accompanied by concerns over a credit rating downgrade,” he said. Potomac Research Group is a Washington-based independent research firm that provides policy and market analysis to institutional investors. The U.S. economy and government budgets appear to be getting a little stronger as 2013 gets underway. The economy grew at an annual rate of 3.1 percent in the latest quarter of 2012, which was the fastest quarterly growth since late 2011, and more than twice the previous quarter’s anemic 1.3 percent growth rate, according to the U.S. Commerce Department. Exports increased at a fast pace in the third quarter, as did government spending, particularly state and local government spending, said the Commerce Department in its latest quarterly report. Consumer spending, which is responsible for nearly three-quarters of U.S. economic activity, rose 0.2 percentage point to 1.6 percent, in the latest quarter reported for 2012. Total nonfarm payroll employment rose by 146,000 in November 2012, and the unemployment rate edged down to 7.7 percent, the U.S. Bureau of Labor Statistics reported. Employment increased in several sectors, including retail trade, professional and business services and health care. The U.S. housing market appears to be on the mend, with a reduced number of foreclosures reported, a robust increase in housing starts, and a strong recovery reported in other residential construction. An improving economy could translate into increased government spending. In 2013, government purchases of goods and services will reach $3.08 trillion, up a little from $3.07 trillion in 2012, according to Lexington, Mass.-based economic forecaster IHS Global Insight. Of that amount, federal government purchases of goods and services will total $1.20 trillion in 2013, while state and local government purchases will reach $1.88 trillion. By 2018, government purchases of goods and services will rebound to $3.36 trillion, predicts IHS. Of that 2018 amount, state and local purchases will total almost $2.2 trillion. Uncle Sam, however, will be buying a little less in 2013. The value of federal purchases of goods and services will equal $1.20 trillion in 2013, down slightly from $1.22 trillion in 2012, according to IHS Global Insight. As 2013 starts, government managers have their fingers crossed that the U.S. economy will continue its recovery. More clarity would help in federal budget deliberations, said Scott Pattison, executive director of the Washington-based National Association of State Budget Officers. “The lack of certainty and predictability,” he said, is a concern to states as they ponder their long-term debt situations and future purchases.